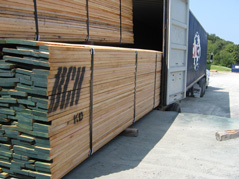 BCH Trading is able to offer a range of Southern Yellow Pine and Hardwoods from the Southern, Appalachian as well as Northern productions. We carefully choose stock from our suppliers according to the specific needs of our customers. Our lumber is kiln dried, bundle tallied, and delivered in a container to the customer's port of choice in the shortest amount of time at the best available price. Service is our business, we can schedule deliveries for even demanding manufacturing groups. All commercial SYP grades and thickness produced in the Southern United States. Widths are available in 4" to 12". Rough products: Saps, Prime & Better, Select, Merch, #2 rough. 4/4, 5/4, 6/4, 1-5/8, 8/4 – to name a few. As well as export timbers 4x4 up to 12x12. Grades are per the 1982 SPIB export grading rules. Our list of species available includes White Oak, Red Oak, Poplar, Ash as well as Hard and Soft Maple. Thicknesses range from 4/4 through 8/4 and are all graded according to the NHLA's demanding rules. 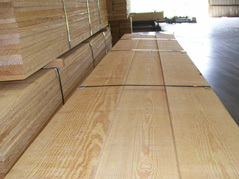 We understand that your production depends on a good consistent supply of quality lumber at a competitive price. BCH offers the "one stop shop", high quality woods and the dependable service to give the customer peace of mind. Whether you are interested in random width, random length loads or selected widths or lengths.